Implanted device decompresses the spine and relieves back pain. In 2000, longtime engineer Wayne Lanza left his employer of 24 years to work full-time with his own business, Composite Design. 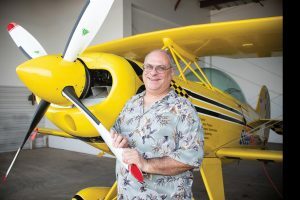 His job involves designing and manufacturing electrical systems for high-end experimental aircraft, then doing the hands-on wiring of the aircraft. Bending while wiring was hard on Wayne’s back, which had suffered since his youth. The Superion spacer device is allowing Wayne to work pain free. “Growing up, I was a roughneck,” Wayne admits. “I wasn’t a brawler, but I did a lot of stupid stuff. I worked hard as a kid for my dad in his shop. I did a lot of grunt work and steel work up on ladders, and had a couple of falls. The falls were nothing major, but enough to overstress my back. Then, years later, things started tweaking. Wayne’s condition deteriorated further over time, so eight years ago, on the recommendation of a friend, he made an appointment with Harold J. Cordner, MD. Dr. Cordner is board certified in pain management and anesthesiology and practices at Florida Pain Management Associates in Vero Beach and Sebastian. Dr. Cordner offers the most up-to-date nonsurgical techniques for relieving his patients’ agony. “Dr. Cordner determined that the pain was coming from discs in my lower back and spinal stenosis, which caused sciatica,” shares Wayne. 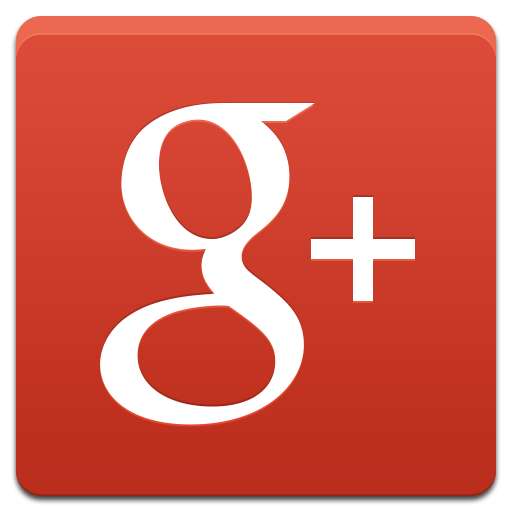 “He performed radiofrequency ablation to destroy the nerves in the area, which helped for quite a while. Then, two years ago, the pain got really bad. “It was horrible. The pain ran down my thighs into my calves and into my feet. There were times it almost brought me to tears. I went through quarts of topical pain cream trying to calm my legs. I wasn’t getting any sleep. I went six months without a decent night’s sleep. My legs were screaming all night long. My pain level was easily a nine out of ten. Determined to avoid surgery, Wayne returned to Dr. Cordner. He wanted to see what treatments the pain specialist had to offer. Dr. Cordner didn’t disappoint. He recommended spinal decompression using the Vertiflex® Superion® Interspinous Spacer System. The Superion spacer is an H-shaped implant made of a titanium alloy that fits between two adjacent bones in the lower back. It is designed to limit movement of the spine when the patient stands and walks, relieving painful symptoms. “Wayne was an ideal candidate for the Superion spacer because he had the characteristic symptoms of spinal stenosis,” states Dr. Cordner. “These include pain in the lower back and legs when he stands or walks for any length of time, and weakness and fatigue in his legs. As soon as he laid down, his pain went away. Traditionally, treatment for spinal stenosis begins with nonsurgical steps, such as physical therapy, anti-inflammatory medications, chiropractic manipulation and steroid injections. When all nonsurgical efforts have failed, surgery is generally the next step. And some people, like Wayne, simply choose to avoid surgery. During a laminectomy, the surgeon removes some of the bone, and any bone spurs and/or pieces of ligament that are compressing the nerves. Doing this opens up the space for the nerves and relieves pain. However, it requires one large or multiple smaller incisions, a lengthy recovery period, possible serious complications and there is no guarantee it will succeed. The Superion spacer is an excellent alternative to surgery. The device is implanted during a brief, 20-to-30-minute, outpatient procedure using local anesthetic and sedation. Dr. Cordner works through a small, one-half-inch incision. “During the implant procedure, I make the incision in the back and clear out some tissue between the spinous processes on the vertebrae,” explains Dr. Cordner. “Then, I insert the device through a small tube about the size of a dime. The Superion InterSpinous Spacer is placed between the vertebrae and holds them open. This relieves the pressure on the nerves in the spinal canal. Dr. Cordner points out that the Superion spacer has proven results. In a five-year study, the success rate with the device was more than 85 percent. The study showed the results at five years were at least as good as those at one year post-procedure. 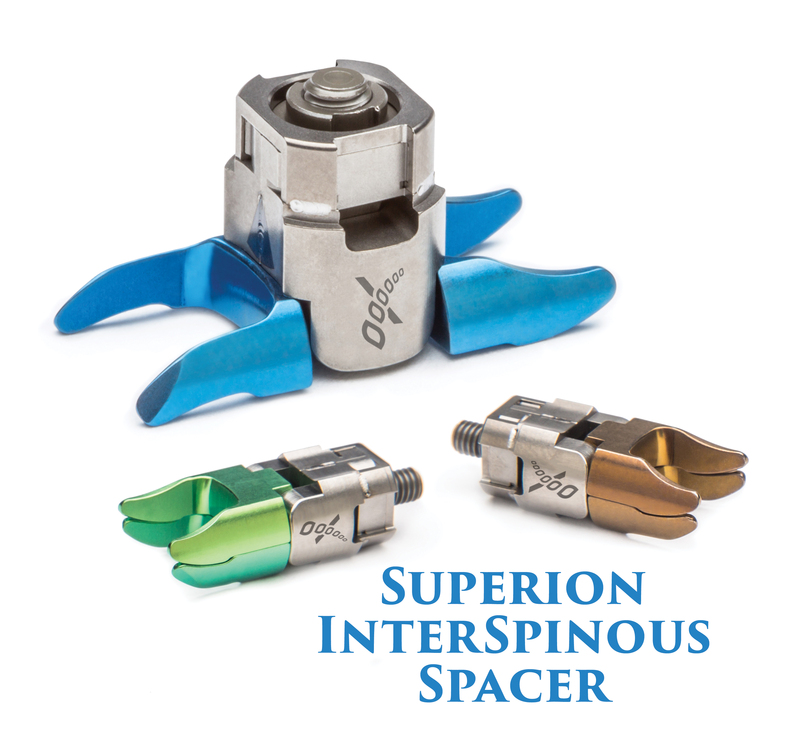 The Vertiflex Superion Interspinous Spacer System was the perfect alternative for Wayne. Not only did he avoid surgery by getting the Superion device, he also experienced results quickly following its implantation. “About forty-five minutes after the procedure, I got up, and all that pain down my legs was gone,” Wayne marvels. “It took probably three weeks for all the nerve damage to be mitigated, but the worst part of the pain was pretty much gone instantaneously. “It’s been nine months now, and I’m feeling much better. I’m getting around. I’ve got my energy back. I sleep fine. I have a lot of work at the shop, and I can keep up with it now. At the end of the day, my back is a little tired, but I don’t have that pain down my legs like I used to. It’s remarkable.